Oxford Community Market (OXCM) kicks off its 2018 season on Tuesday, April 17. 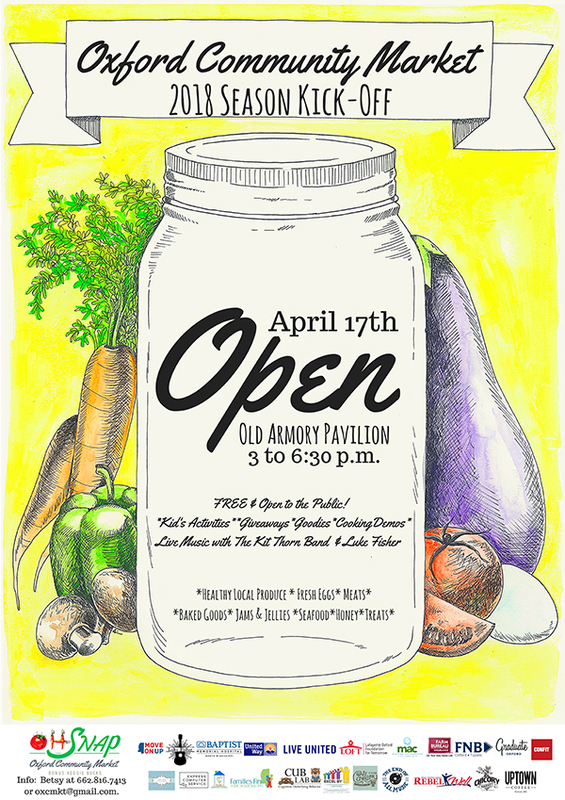 The first market will be from 3–6:30 pm at the Old Armory Pavilion, 1801 University Avenue. “January is when I started pulling together all the details for not just the grand reopening but for the entire of year of programming activities and special events at the market,” said said Market Director Betsy Chapman. Following the first market, OXCM supporters are in for a treat: six chefs from some of Oxford’s best restaurants are teaming up to host First Market Feast, a farm-to-table fundraiser dinner to benefit the market. Tickets for the fest are $75 per person, which includes wine, or $100 VIP package, which includes access to VIP bar. Get your tickets by visiting oxfordarts.com. “It’s been really great,” said Chapman. “I was blown away that all of those restaurants were willing to get together and collaborate on a dinner for the market. It’s the cream-of-the-crop, all-star chefs. The team of chefs behind First Market Feast includes Vishwesh Bhatt of Snackbar, Corbin Evans of Oxford Canteen, Joel Miller of Ravine, Nick Reppond and Heath Johnson of GRIT, and John Stokes of Tarasque Cucina. “We’ve got more chefs shopping every week as well as doing special orders directly from the farms. It’s a really good sign for the local food community,” said Chapman. For these chefs, farmers markets offer more than just a place to source high-quality, locally grown food—they offer inspiration. 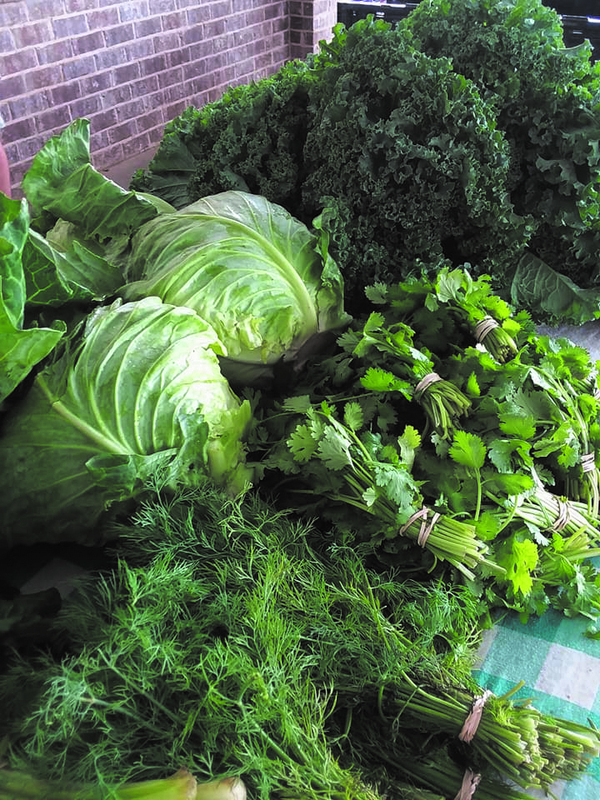 The event will feature local early spring produce, eggs, honey, meats ,and baked goods from OXCM vendors and will be served family-style at the market site. “[The chefs] are all collaborating on a cohesive menu based on what’s available produce wise,” said Chapman. Wine pairing for dinner is provided by event sponsor Kiamie’s Wine & Liquor. The pre-dinner reception starting at 6:30 pm will feature Cathead Vodka seasonal cocktail and appetizers. Tate Moore and Dave Woolworth of the Kudzu Kings will provide music during the reception and dinner. In addition to the First Market Feast, OXCM will also have free activities throughout the market’s season designed to educate about what foods are in season, who is growing their food, and rotate special events each week, “to be a place where people can come together and really experience the best of Oxford,” said Chapman. All proceeds benefit Oxford Community Market, a 501c3 organization, and its programs to improve access to fresh, healthy local food for shoppers with limited incomes. For more information about the market and its programs visit oxfordcommunitymarket.com.